Sonja is a daughter of a Turkish (Byzantine) Legatus. When she turned twelve, she chose to join the Roman navy, much to her father's surprise. After swabbing decks, stitching sails, and otherwise learning sea life, she eventually rose to the rank of captain in the Imperial Roman Navy. Her most notable command was to ensure safe trade in the eastern Mediterranean, and suppressing the occasional pirate raid or local revolt that occurred occasionally. In the sack of Jericho by pirates, she lost her ship, barely escaped with her life, and saw her husband hanged by pirates. 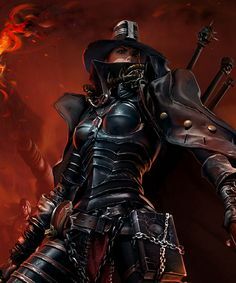 She rejoined a relief force and fought to liberate Jericho, and swore vengeance against all pirates -- not just for her husband's murder, but for all the brutality done to the inhabitants of Jericho. With the increased pressure by Arab invaders along the southern coast, the Roman Empire eventually ceded more control to the local governments and pulled back imperial units closer to Constantinople. Sonja left the navy and took up a more itinerant life,. her travels taking her through Asia as far as Cathay. Along the way, she has built up a reputation as a pirate killer. She decided to go to Salaya Sole partly because she had heard piracy was particularly prevalent in that area. Last edited by Woe on Wed Nov 23, 2016 3:15 am, edited 18 times in total. Description : Majutsu-Ishiku (Maju for short) hails from the mountains of the eastern islands of Kona-Toro. He was raised in a small village whose economy depended heavily on the nearby quarry that produced much sought-after stone blocks; the naturally dense stone was used in the famous Dojoyo Castle, among other well-known regional emplacements. Unfortunately for Maju, he was rendered physically weak by a witch’s curse on his mother while she was pregnant with him. In an economy that depended on a man’s ability for physical labor, Maju became an outcast in his home village. He was mistreated and derided by all, including his own family, essentially filling the role of village whipping boy. For his own survival, Maju learned how to beg for food by relating to others and to manipulate them, increasing his own Charisma in spite of his low position. His only joy, and escape from his persecutors, was going to the high mountain near the village where he befriended a pair of falcons by feeding them scraps of meat, even though he had little to spare. Unbeknownst to all, the witch’s curse on Maju’s mother had the additional effect of imparting to Maju an unusual connection to the magical and arcane. Maju began to realize this when he was an adolescent. The only local scholar took pity on Maju and began to tutor and mentor him in exchange for his help in the small village library and records office. Once the scholar trusted Maju, he revealed that he was actually a mountain sorcerer, and that he had sensed Maju’s natural arcane abilities. The villagers were suspicious of any magic, especially after their experiences with the tormenting witch, so Maju resisted. Still, the scholar was his only friend, so he indulged the elder’s desire to teach him. One day while being beaten, and desperate to make it stop, Maju used one of the spells to convince the bully that Maju was his trusted friend. The spell worked so well, that the bully began to act as Maju’s body guard. This was a new power that Maju had never before known, and he drank up any knowledge of magic that he could learn. Eventually, some of the villagers began suspecting Maju’s magic use as the reason for why the bullies stopped mistreating him. Some claimed that Maju was possessed of evil spirits. Furthermore, the scholar had cast a particularly effective spell of confusion on one of Maju’s antagonists who was especially cruel, rendering him a babbling idiot. Eventually, their sorcery was exposed by Maju’s own father who inadvertently walked in on one of the mages’ sessions. The villagers captured and lynched Maju’s mentor, and Maju was exiled – cast outside the walls of the village into the frigid mountain winter. Fortunately for Maju, his mentor had left him with a scrap of scroll that described the location of his hidden cache of arcane belongings – his spell book, some scrolls, as well as a small brass bottle with special instructions describing it as a ‘Efreeti Bottle’ from the westerlands, and explaining its use…and its dangers. To–date, Maju has been too afraid to attempt to use it. Carrying these items, and using magic to survive, Maju made his way off the mountain to the lowlands, but not before visiting the family of falcons that he had befriended. The mating pair offered Maju one of ther hatchlings, which Maju named Taku and took as his familiar. Over the subsequent weeks, Maju made his way to the coast, using magic to earn money along the way. Once to a port, he made his way to the mainland to eventually book passage to the southern islands of Salaya Sole where (he was told) resides his mentor’s mentor. Physical Appearance: Maju is short of stature and slight of build. While weaker than most, he is no less hardy than the average human (perhaps due to his survival of repeated beatings in his youth). He prefers to not be noticed, and therefore wears poor, non-descript cloth – a loose-fitting cloak over his trousers and tunic, boots, and a soft cap. His arcane writings and devices remain closely hidden and protected; based on his experiences, Maju tries to avoid being recognized as a Magic-User. He visibly carries two black-powder pistols in hopes of deterring any would-be antagonists from getting too close, and anyone else for that matter. Personality: Considering Maju’s background, it’s a wonder he’s willing to interact with other sentient creatures at all. His long years of mistreatment have left their mark in that, despite his easygoing, likeable, and influential nature, Maju prefers to be on his own. He doesn’t make friends easily, and tends to keep to his own company. He is very reluctant to reveal that he is a Magic–User. In spite of his difficult experiences, he maintains an upbeat, indefatigable attitude. What Maju loves: Maju loves solving problems in elegant ways. He seeks to avoid conflict and instead solve situations by his guile, creativity, cleverness, and magic. What Maju hates: Maju hates bullies in any form (for obvious reasons). He has a strong sense of justice, and will step in if he observes someone being mistreated in such a way. Why Maju is part of the party: He booked passage on the ship seeking his mentor’s mentor at the destination port city. Otherwise, he doesn’t have a connection to anyone on board. Still, through the shipwreck, he has observed some of the ship’s occupants to be quite capable, and perhaps worthy of banding with. Weapon 1: Black Powder Pistol, 1d8, +2 to hit, ROF: 1/2, Weight: 2. Weapon 2: Dagger, 1d4, +1 to hit, Weight 1. Weapon 3: Grenade, 1d6+4 (15’ radius), +2 to hit, Single Use. 2 Black Powder Pistols, slung visibly outside of cloak (weight: 4). 2 Black Powder Grenades, concealed under cloak. - Powder Horn (weight: 5). - Efreeti Bottle containing Laylat AlHariq (3 hours/uses remaining). - 2 Spell Books (one is his departed mentor's, the other is his own within which he has copied all of his mentor's spells that he can access)(weight:2). - 1 book found in underground monkey laboratory. -Scroll Case with 2 scrolls (4th Level: Hallucinatory Terrain; 10% chance of fail/miscast)(Three unknown magical spells of medium level)(weight 1/2). - Dark stones (3, had Continual Dark cast on it). Maju gains 3 hp and Taku’s distance vision when w/i 120’. 1st Level: Read Magic; (Charm Person); Detect Magic; ((Magic Missile)); Read Languages; Sleep; Ventriloquism. 2nd Level: Continual Light*; ESP; Phantasmal Force; (Web). 3rd Level: Dispel Magic; Fly; Haste*; Invisibility 10’ Radius; (Lightning Bolt). Standard memorized spells are indicated with parentheses: (text). Last edited by MevlyTM on Fri Dec 30, 2016 8:12 am, edited 23 times in total. Cowardly camel, named Dungbreath. Spithead is an oft-used nickname. The necklaces on the ghouls are made of silver, badly tarnished. if Yuan Cheng was able, he'd tell you it was from his order, but probably from a different monastery. It could be worth 150gp. One necklace, on the leader, also has a sapphire worth about 50gp in addition. 200gp all up, round tally. Last edited by Woe on Fri May 20, 2016 2:39 pm, edited 1 time in total. Eyes: Brown, but you can find hints of red on a bright day. Fighter 6. BAB +4. Melee +6, Missile +4. Languages - Siamese. She understands about 75% of what Islander people are saying. Pistol d8, +4 - which she calls "Krayasart"
AC 15 (leather, +2 ring of protection). Leather armor, cutlass, pistol, 9 days rations, 2 torches, tinderbox, waterskin, bedroll.